Codie Nichols has become an apprentice with Newcastle United Foundation. A sporty student has netted her dream apprenticeship with Newcastle United Foundation. 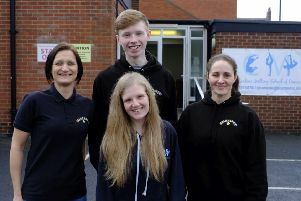 Dedicated Codie Nichols, from North Shields, has become the foundation’s first female apprentice to work with full-time community coaches in schools and clubs across the region. The 17-year-old is studying Sports Coaching (Level 2) with TyneMet, which has seen former students Joe Deverdics, Carl Chater, Andrew Johnston and Lee Fairley all go on to work for the foundation. Codie said: “By studying at TyneMet College it has allowed me to have a lot of opportunities that have led me onto my career path. I have a huge drive for coaching and having it as an everyday job is fantastic.